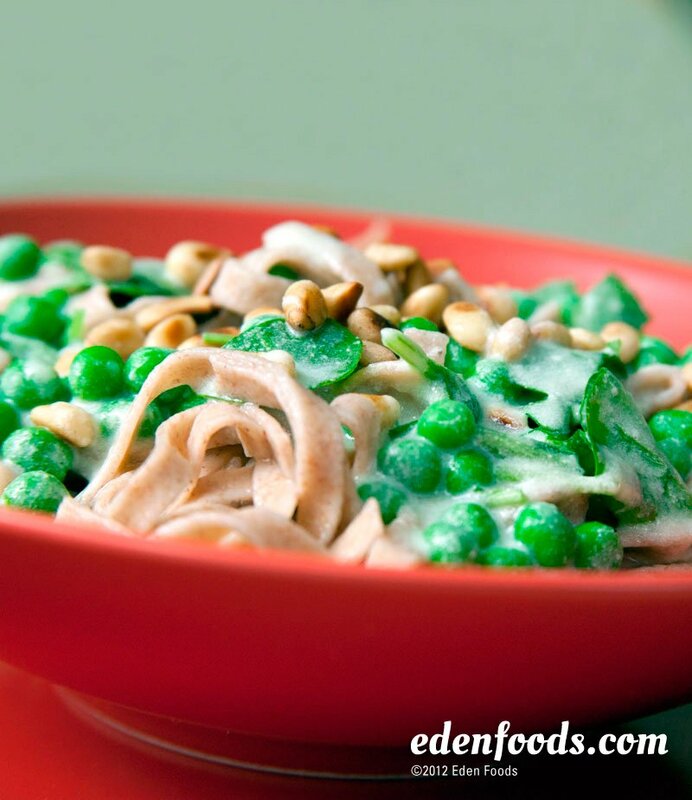 Cook pasta as package directs and add peas 1 minute before the end of cooking. Drain the pasta and peas and return them to the pot. Combine Edensoy, vegetable broth and flour in a large skillet. Whisk and simmer until slightly thickened, about 7 minutes. Stir in parmesan until melted. To toast pine nuts, place in a small skillet over medium heat. Push back and forth with a wooden spoon or shake the pan frequently until golden, about 1 to 2 minutes. Remove from pan immediately to prevent burning. Add the sauce to the pasta and peas. Mix in the arugula and toss. Season with salt and pepper. Serve garnished with pine nuts.